It is a remarkable time for molecular biology. Last month alone, scientists reported editing human embryos to correct the mutant gene responsible for an inherited form of heart disease and creating genetically engineered piglets free of retroviral DNA, making the animals candidates for organ transplants into humans – both using the new form of gene editing known as CRISPR. The last few decades of research in the field of molecular biology have been dedicated to reading our DNA. With CRISPR we now have the power to edit it, rewrite it, and even create new passages in our genetic code. 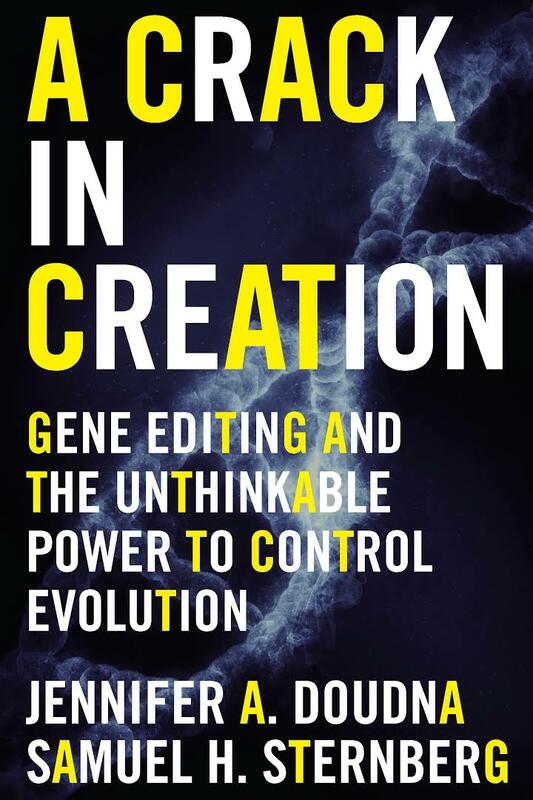 In A Crack in Creation, Jennifer A. Doudna, a biologist at the University of California at Berkeley, and co-author Samuel H. Sternberg (a former postdoctoral fellow in Doudna’s lab) take us on a journey through the history of gene editing, the discovery of CRISPR, and the implications of wielding this powerful tool. Fast-paced and accessible, the book is at turns optimistic and cautionary about our ability to manipulate our genomes. As debate and controversy swirl around who actually discovered CRISPR, who “owns” the technology, and who will profit from it, this book is required reading for anyone concerned with our medical and agricultural future. In 2012 Doudna and her colleagues published research showing that CRISPR was a novel gene-editing system. Soon after, they realized that this bacterial system could be developed to edit DNA in any organism. By early 2013 multiple research teams, including Doudna’s, had edited DNA in human cells. Doudna describes standing at the precipice of this momentous discovery and realizing that “nothing after that would ever be the same – not for [her], not for [her] collaborators, and not for the field of biology.” With this ancient and almost absurdly simple two-component system – CRISPR and Cas – the possibilities for fiddling with the code of life are endless. It is not clear that humanity is prepared for this Promethean technology. It is already here, however, and we can do almost anything with it. But should we? Doudna says yes, but advises us to proceed with caution. In the first part of the book, “The Tool,” Doudna interweaves anecdotes about her scientific career with accounts of breakthroughs in the field of gene editing. The story is exciting, not least because you know as a reader that this remarkable scientist is poised to become a giant in the field. She tells us about the discovery of the CRISPR system, and champions its applications in curing disease and creating better crops. Less than a year after Doudna published her pioneering paper on editing human cells with CRISPR, a Chinese research team successfully fixed a mutation in a single letter among the “2.8 billion DNA letters of the mouse genome” in a live mouse. CRISPR could be used to cure diseases with single gene mutations, like Huntington’s disease in humans. With more research it could be deployed to target the genetic root of more complex diseases. It is impossible not to be awed by CRISPR as Doudna describes the technology and its potential. Though I am a molecular biologist myself, and understand the tenuous arc of translating method to medicine, as I read this part of her book I start to have visions of a utopian, disease-free future where no one goes hungry. Mistrust of science is as old as science itself. Public opinion has at various points in history decried science as wasteful, overreaching, and heretical (examples range from Gallileo’s conflict with the Pope in the 1600s to Sarah Palin’s derision of fruit fly research–a powerhouse of genetic studies–during the 2008 US Presidential election). We live in an era where science and technology advance with astounding speed, while at the same time we are seeing an emergence of a rabid anti-science sentiment among non-scientists. Doudna tells us early on in the book that nature is the biggest gene-editor of them all, and that mutations in diseases sometimes correct themselves (there is very little data on these cases because they often are unreported). But based on the mistrust and fear surrounding our newfound abilities to write our genetic code, it seems people would rather have a fickle god or a random mutation controlling our destiny than humanity itself. If the debate surrounding this technology has been intense, the question of ownership is even more so. In 2013, three titans of the gene-editing field – Doudna at Berkeley, George Church at Harvard, and Feng Zhang at The Broad Institute (of MIT and Harvard) – demonstrated that human cells could be edited by CRISPR. The race for a patent began, and collegial collaborations have devolved into a skirmish over money and fame. At present, the Berkeley group is appealing an initial decision by the U.S. Patent and Trademark Office to award the patent for CRISPR to The Broad Institute. Many biologists, including myself, worry that the push for profitability in the private sector will result in sloppy science. CRISPR is so simple to understand and so easy to manipulate that there are already DIY CRISPR kits on the market. Tech companies have launched their own research into both genome editing and gene drives (where genetically modified animals are released into an ecosystem to change the genetic landscape of the wild). Editing the human genome raises more than a simple ethical dilemma – it raises a scientific one. The CRISPR sequences might target unique DNA in bacteria or in other cells, but the complicated human genome has 3 billion base pairs and chances are that the CRISPR-Cas system might cut DNA where it is not supposed to (referred to as off-targeting). While the desire to treat disease might outweigh the need to assess every detail of this technology, it is unclear if the public will see it that way. George Church has pointed out that we had limited knowledge of the immune system before we inoculated populations against disease and that the same logic should apply to all medical breakthroughs. Scientists are, by nature and by profession, skeptics. We are a careful and self-correcting group – it is unlikely that CRISPR will be applied in clinical trials without a great deal of experimentation to limit off-targeting. However, there is nothing we can do to assign one hundred percent certainty to an outcome, and increasingly, it is this type of certainty that the public wants to see. Whatever the end result of the debate around CRISPR, the implications of this technology are so huge that, despite its potential, one can argue that the people funded it, the people own it, and the people can use it as they decide. We have the power of creation in our hands. The question is, do we trust ourselves to use it? Rhea Datta, Ph.D., is a molecular biologist at New York University. She studies early embryonic development.